.. .. .. .. .. .. .. .. .. .. ... .. .. 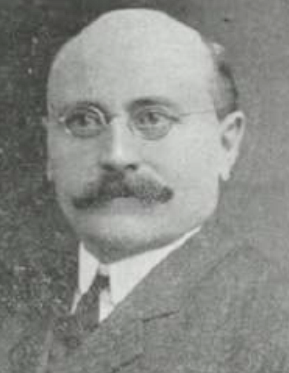 The man responsible for much of the modern day development along Burnell Street south of Ellice Avenue was Thorstein Oddson. Thorstein Oddson was born on December 6, 1864 in Husavik, a remote fishing village on the north-east coast of Iceland. He was the youngest of eight children of sheep farmers Oddur Thordarson and Gudrun Snorradottirin. Oddson trained as a carpenter and in 1886 married Rakel Sigfusdottir. Two years later, the couple and their two sons, Leifur (b. 1887) and Thoroddur (b. 1888), left for Manitoba's Interlake. 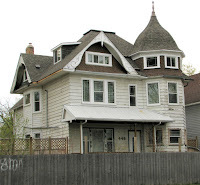 After a few years working as a carpenter, in 1894 the the family settled in Selkirk, Manitoba. That year, Oddson built and operated what was likely a hardware store, (later the Altrubin and Co. store), and a family home on Morris Avenue. The family grew by five daughters: Olaf, Gudrun Lera (Laura, b. 1893), Klara (b. 1894, who died as a young child), another Clara (b. 1896) and Rakel (Rachel, b. 1901). The family relocated to Winnipeg in 1901. They initially lived at 520 Young Street, then at 559 Ellice Avenue. In 1902, Oddson partnered with fellow Icelanders Skuli Hansson and John Vopni in a real estate, investment and insurance firm. Though their offices were located downtown the company concentrated most of their efforts on the West End. 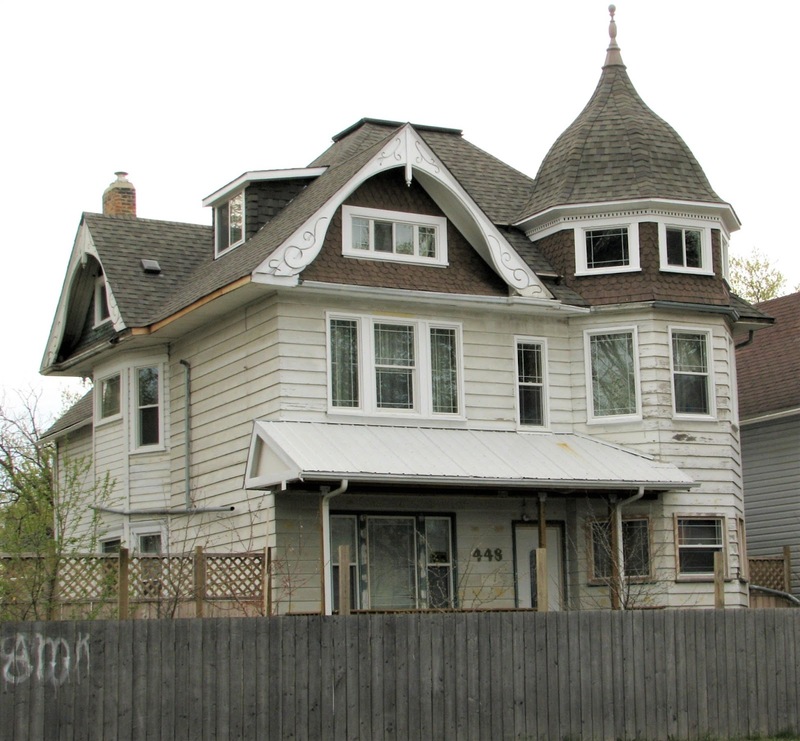 Oddson purchased the large lot at 448 Sherbrook Street in 1905 on which to build a family home. The architect was fellow Icelander Paul Melsted Clemens who designed dozens of buildings, mostly apartment blocks, for Oddson and other developers. The partners in the real estate company went their separate ways in 1907 and a new company emerged. Initially called Oddson and Company, it became Oddson and Son when eldest son Leifur joined him then Oddson and Sons when Thor joined. 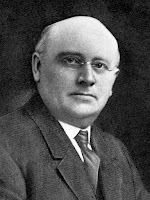 Oddson sold off his remaining interests in the subdivision in 1911 and is said to have made about $250,000 on the venture. He then invested much of his wealth in apartment blocks. Oddson's company already owned some buildings and acted as leasing agents for others. Around 1909, he likely partnered again with architect P. M. Clemens to build the 28-unit Haselmere Apartments on Ellice Avenue near Maryland Street and with architect D. W. Bellhouse on the Coronado Block at 485 Furby. Most of Oddson's attention, though, was spent around Burnell Street. For some time, he had been buying up its pasture land as it came on the market, perhaps wanting to construct a mini-Golden Gate Park. There was one difference: rather than an exclusive suburb, Burnell Street would have a working class feel. 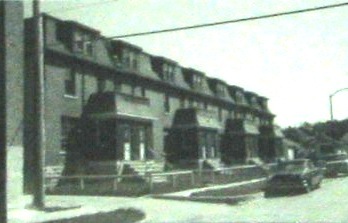 In 1909, he took out building permits to construct ten houses on Burnell costing an average of $3,000 each. He announced that he planned on taking out ten more at a alter date. 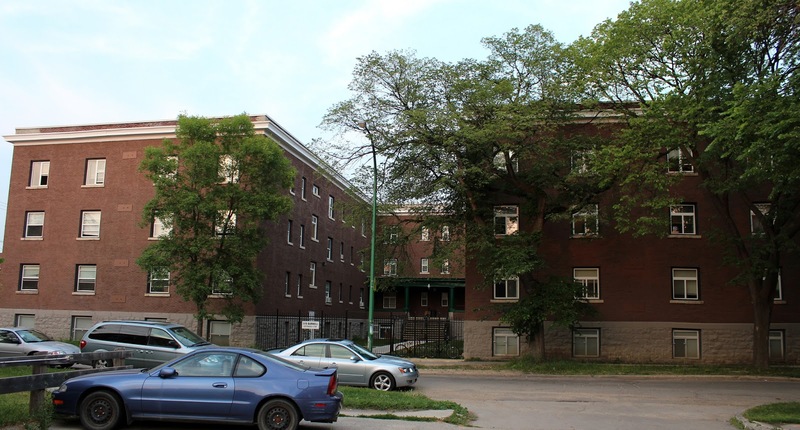 Oddson also built at least seven apartment buildings in the area, most of which featured small one and two-bedroom units in the 600 square foot range. According to one old-time resident of the area, Oddson owned some of the land on the west side of Burnell as well. Much of that was sold off to become industrial sites that required large numbers of workers, such as Canada Bread, Bryce's Bakery and Crescent Creamery. There was also a church that Oddson had built at Burnell and Ellice and land for Greenway School which opened in 1910, though it is unclear if the school division bought the property directly from from Oddson. Oddson's first development on Burnell Street near Ellice was Claremont Court (1909), now demolished. It consisted of two long, single-storey buildings each divided into five small "cottages". The buildings faced each other across a 50-foot grassed courtyard. St. Paul Terrace and "the triplets"
The following year, he turned his attention to St. Paul Avenue, a short side street that connects Burnell to Arlington. Both the Claremont and the triplets advertised one and two bedroom suites of just 600 square feet in size. In 1914, Oddson took on his final and largest project: Thelmo Manisons on Burnell Street. According to one newspaper story of the day it was the largest apartment complex ever approved for construction in Winnipeg with Oddson noted as the owner, architect and builder. 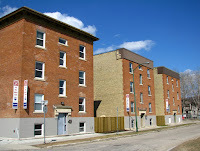 The $236,000, (over $5 million in today's money,) three-storey block contained 78 small suites that used roll-out beds and built-in closets to maximize floor space. Though small, the apartments were well appointed and the block featured a courtyard entrance. Staircase walls contained large landscape murals, something found in more exclusive Icelandic homes. The church that Oddson had built was called Skjaldborg Lutheran Church on Burnell Street at Ellice, what is now the General Wolfe School playground. It was also designed by Clemens and erected in 1913, though it was likely more modest that the above drawing suggests. Skjaldborg had a hall and space for Sunday school classes. It was also the first home to the private Icelandic school called the Jon Bjarnason Academy from its creation in 1913 to 1915. Rev. Runolfur Marteinsson was its first pastor. The school division bought out the church in 1921 as part of an expansion of the General Wolfe School property. It sold off the building to someone who would move it off-site. Oddson was a leader within the province's Icelandic community and a member of the Independent Order of Good Templars through the West End's IOGT Hall located at 635 Sargent Avenue. For a time, he was vice-president of Columbia Press which published Lögberg, the city's liberal-leaning Icelandic-language weekly newspaper that is still in operation today. Oddson was also said to be generous and willing to lend a hand to those in need. In 1913, he donated the Oddson Shield, the coveted award for the best overall score for a track and field team given out at Gimli's annual Islendingadagurinn until at least 1970, (with a break from 1940 to 1953). In 1924, Oddson donated a $1,000 organ for a new Lutheran church in Selkirk, though it had been a couple of decades since he lived there. Like many developers, Oddson ran into financial trouble during World War I. 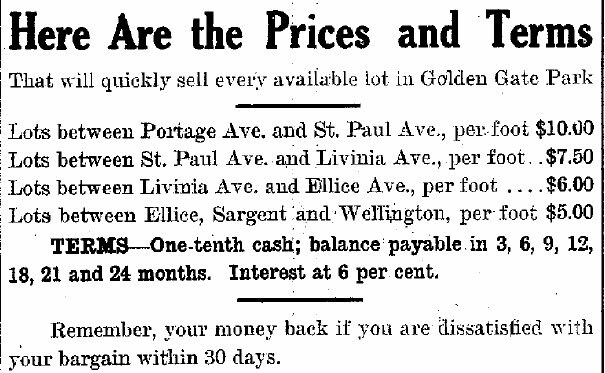 The city fell into a deep recession in 1913 when wheat prices plummeted. This had a spin-off impact on the price of land and demand for homes. The war further disrupted the wheat market and put a near moratorium on new property development. No doubt struggling with the financing on his massive Thelmo Mansions project, Oddson began to sell of his real estate holdings. 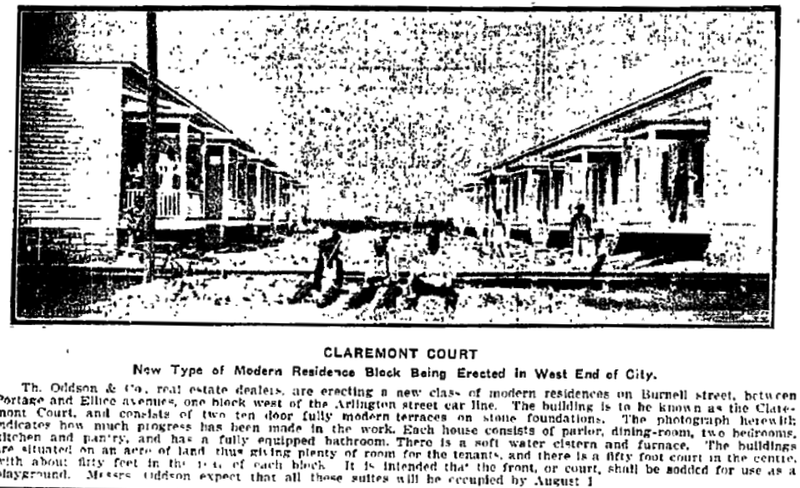 Claremont Court, for instance, was sold at a mortgage auction sale in January 1916. Oddson and Sons continued on until the mid-1920s, though it appears to have stuck to selling homes and property management rather than development. On October 12, 1924, Thorstein and Rakel Oddson crossed the border at Noyes, Minnesota on a Great Northern Railway train to take up residence in Los Angeles. 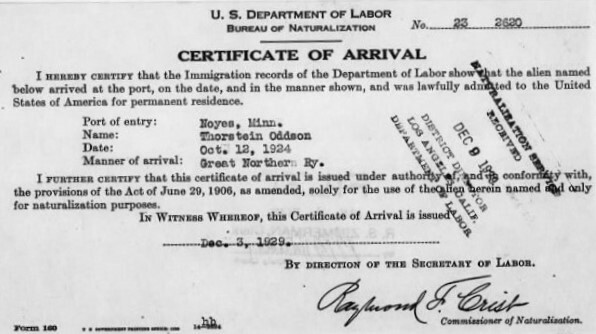 Thorstein applied for American citizenship the following year. 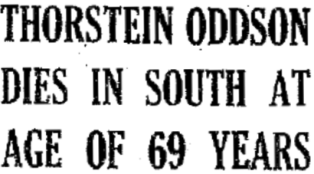 Thorstein died at their home at 112 Hobart Boulevard on Friday, August 4, 1934 at the age of 69. Rakel died in Los Angeles in December 1938 at the age of 77. The last of their children, daughter Rakel, died in Winnipeg on March 19, 1979. He was my great grandfather. My grandmother was Clara Oddson. She married Hubert Clark (aka Bert Clark who was a professional ice skater and worked with Sonja Henie for many years). They had one daughter, Olof Roberta Clark (spelled with an "o"). She married my Dad, John Frank Bresnik, in October of 1936 and I was born in Los Angeles in 1940. They had two more children (Robert Anton, 1944 and Nancy Marilyn, 1948). We lived in West Hollywood until I was 8. The family moved to Pacific Palisades in 1948 to 1107 Embury St. Then that same year Bert and Clara moved to 1130 Galloway - two blocks from our house. After finishing work with Sonja Henie (he did a comedy routine in her ice shows) he went on to manage the Polar Palace Ice Rink in Los Angeles. My Dad was a theater lobby poster artist in the 30s and opened a sign company in the 40s and was located on Sawtelle Blvd in West Los Angeles until he died in 1992. In 1965 I married Sylvia Bergin of Dublin, Ireland. We had five children: Pauline, Robert, John, Angela and Stephen. I was a professional jazz pianist for nine years and then joined Dad in the sign business. Sylvia was a full-time Mom until 1986 and then worked part-time for many years. She began doing triathlons in 1984. She added marathons in 1996 and also 100-mile "century" bike rides at about that time. She climbed Mt Whitney twice and Half Dome in Yosemite twice. We left Santa Monica in 1977 and moved to Escondido - 100 miles south. We just celebrated our 50th anniversary last year. Two of the boys still live in the area, but the other three moved away (London, Brooklyn, NY and Ellicott City, Maryland). We have five grand children. Thanks so much for this. I love to hear follow-up stories about the people and families I write about. I live in one of Oddson's buildings and there's a little "historic marker" sign at the back door crediting him. I am also starting the process of trying to get a Burnell Street park named after him. Part of the park process is to add some tidbits of information I have found about him to in the years since I first wrote this post. Also, to clean up some typos and formatting issues. I have just completed that, so if you re-read this post now it will look a bit better ! My personal email is cassidy at mts.net. if you'd like to email me and can keep you up to date on the park issue. Oh, how interesting, he was my great-grandfather, too. My grandfather was Leifur Oddson, so Clara's sister, John. I just pulled up this blog post again (I had seen it before) to send to my daughter Jennifer Graham who is in Iceland now with the Snorri Program. Leifur was the oldest of the "sons" in Th. Oddson & Sons. Leifur married my grandmother Asta Jonsdottir (also went by Asta Austmann). Leitur had two children with his first wife, who died in the flu epidemic, and then four more children. My mother, Olof (with an o) Rosemary is their youngest. It's delightful to see so much information about my mother's grandfather - she has told us many stories about him, and has shared photos. I believe she has a photo of your grandmother, John, as a child. I'll have to take a look. Hi Jodine - I'll have to get back to you later to go into more detail, but thank you for contacting me. My second cousin's mother was one of the daughters -- I remember her as "Auntie Rae" but you'd have to contact Eric (the second cousin) for details - not sure of the spelling. Another one was "Auntie Leva" (pronounced Lee-va). Of course, my grandmother was Clara and I don't remember the fourth one. My mother's name was Olof, also. I didn't hear much about the senior Oddson, but the only thing I remember was that he built a very large apartment complex that was partially built on another property. There was a lawsuit and he lost a lot of money. It would be interesting to see a "tree" to see where everybody fit in... I'm a graphics guy and I need to look at pictures. At any rate I'll get back to you -- have to run right now. Here's a photo that Eric either gave me or sent me a scan (can't remember which). If you have any photos of that era I'd be interested. My grandmother is on the left. guess I can't attach a photo -- I have a photo of the whole family taken in 1906. I can send it to you if you want. You can reach me at jcbresnik at gmail.com. I was looking into the history of Skjaldborg Lutheran Orthodox Church once at Burnell and Ellice re: the article above. I found no photos of the Church and wondered if you had found any? Interestingly, your article mentions that Mr.Oddson donated the "Oddson-Shield" Trophy to the Icelandic Games in Gimli. The church's name: Skjaldborg translates to "Shield-Wall" in english, apparently. (a familiar term for those watching a recent program called "Vikings"
Great research on this article...thanks. Visit My other blogs ! Support my work by making a donation! Is Brian Pallister the biggest slumlord in Manitoba? A trio of terrifying interactive attractions awaits in Winnipeg this October — if you dare! This way to the Hamptons! After reading "This Changes Everything"
The power of words ! CHIEF CONCERNS – What Kind of City Do You Want to Live In? 'Peg Arts, Music, Food etc. RANDOM THOUGHTS IN MY BRAIN + A GIVEAWAY! Content and images copyright Chirstian Cassidy, Winnipeg, unless otherwise indicated. Awesome Inc. theme. Powered by Blogger.